Sacalas started the race directly behind rock crawling champions, the Lovell Brothers. He overtook their car by race mile 20 and by the first pit had passed all Ultra4 cars except one; the Watson Brothers in the 4488 car. By pit 2, 4435 had overtaken 4488 as they stopped for fuel. However, just a few miles outside the 2nd pit, Big Ugly suffered a broken driveshaft. Sacalas was forced to choose between racing in 2WD or taking time to replace the driveshaft. Knowing that the top competitors were separated by minutes, if not seconds, Sacalas opted to run the remaining 2/3 of the race in 2WD. “That was a really tough call.” said Sacalas. He continued, “I knew we weren’t as competitive racing with only rear wheel drive, but the race was so close that I wasn’t sure we’d regain position if we stopped to replace the shaft.” At Pit 3, Sacalas slowed down long enough to toss the remains of the driveshaft out the window to his Team Viking Offroad crew before continuing on. For the next 100 miles, 4435 and 4488 continued to battle for the lead. Just before pit 6, with Healy’s 4428 close on his heels, Sacalas once again overtook the Watsons as they stopped for a blown tire. This left the fight for the lead between 4435 and 4428. As fans followed online tracking, the two cars were so close that, due to update delays, it appeared Sacalas and Healy traded off the physical lead several times. However, it was only in the last 5 miles that 4428 overtook Big Ugly to claim the lead. Online fans and those at the finish line waited anxiously as Healy’s tracker began malfunctioning about 20 miles out leaving everyone to speculate as to which former Ultra4 Champion would be the first across the finish line. “After the rollover and finishing 26th at King of the Hammers, I wanted to show that winning Vegas to Reno wasn’t a fluke. I couldn’t have asked for a better race in that respect.” said Sacalas. He went on to say, “Losing the driveshaft was tough, but other than being too hard on the driveline, the car was dialed in. We were fortunate our BF Goodrich tires and Raceline wheels just worked. We didn’t have to change a single tire all day and that’s critical in a tight race like this.” Sacalas also attributed the day’s success to his co-driver, Douglas Williams, for his accurate pace notes and navigation. Additional sponsors that contributed to Sacalas’ successful 2nd place finish were: founding sponsor Viking Offroad, Bilstein, Novak Conversions, Ballistic Fabrication and True Hi-9. 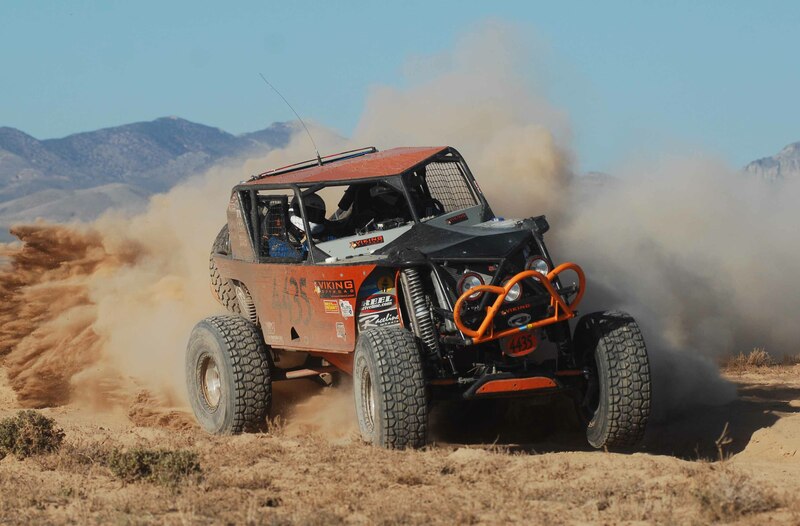 This race was the 2nd event in the 2010 King of the Hammers Grand Slam Series. With his 2nd place finish, Sacalas is now in 3rd place overall. Sacalas’ next race will be the Land’s End Hill Climb taking place in August of this year. For more information about Kevin Sacalas and Team Viking Offroad please visit www.4435racing.com.